One of the techniques that I always do in custom skull implants is the placement of perforations through the implant. These round holes are placed using dermal punches and are typically 4 to 6mms in diameter. They can number from dozens to up to fifty holes per implant. Most patients rightfully assume that connective tissue will grow through these holes and aid in firm fixation of the implant and prevent it from moving after surgery. While that logic is not completely unfounded, the reality of custom skull implants is that the tissue pocket under the scalp is usually very tight. It is hard enough to get the implant into proper position under the scalp. 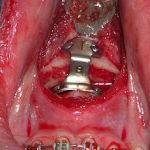 That combined with the custom fit of the implant makes its movement or its displacement from its intended position very unlikely even in the healing process. Once healed and encapsulated it would be virtually impossible for it to become displaced. Perfusion hole placement in custom skull implants Dr BVarry Eppley IndianapolisThe real purpose of these skull implant holes is two-fold. First, the tissue ingrowth and its numerous vertical pillars separates the implant pocket into many smaller pockets rather than one big implant pocket. This is preventative for seroma formation much like quilting sutures are in tummy tuck surgery. Secondly it is always good to re-establish some limited perfusion (vascular connections) through the implant. A custom skull implant cuts out the direct blood supply to the scalp and acts as a physical barrier between the bone and the overlying scalp. While the tremendous blood supply of the scalp and its extensive collateral circulation makes this not a significant concern, it never hurts to re-establish some of the vascular connections. 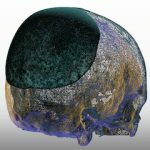 While a custom skull implant never truly becomes integrated into the tissues, the perfusion holes placed allow for some limited tissue ingrowth to occur. Some partial re-establishment of tissue connections between the scalp and bone are created.